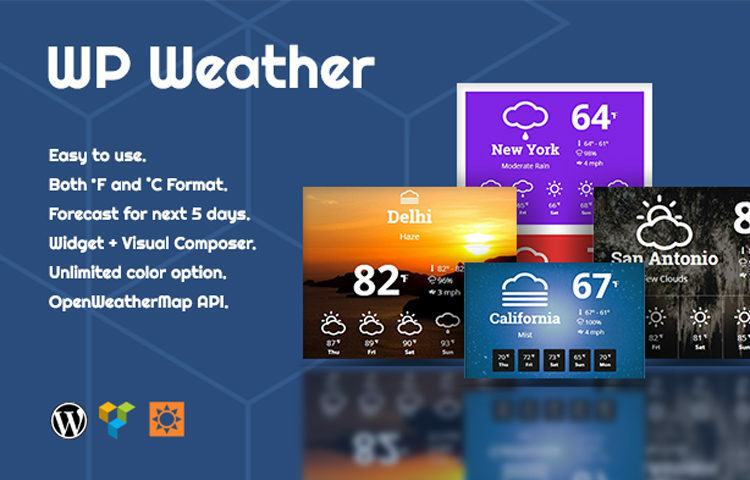 WP Weather is a flexible and easy to use weather WordPress plugin that allows you to show your desired weather using Visual Composer and Widget. You can show any location weather by using city name and the OpenWeatherMap API. WP Weather is a responsive device supported. You can use it in any WordPress theme. Widget and Visual composer addons. Font color, background color and background image option. Displays the weather data on your wordpress pages, posts or sidebar. Displays Weather icon based on current weather. Displays current weather with Fahrenheit or Celsius. Displays Low and hight temperature. Displays forecast for next 5 days. Note: All images are used demo purpose only.